In researching this write-up I came across the same theme over and over. 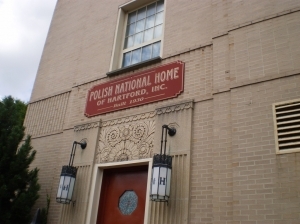 So I’ll follow tradition and dispense with the mild cliché right off the bat – The Polish National Home is one of the worst kept secrets in Hartford. It’s hidden in plain sight. I want to tell everyone about it, but don’t want everyone eating up my pierogies and hogging the seats. That about covers it. My guess is because no one walks by and looks at the weirdly art deco slash communist bloc bauhaus building and says, “Mmm, let’s get lunch!” But I did – and I’ve been wanting to for quite a while now. Once it appeared on Roadfood’s “500 Places to Eat Before It’s Too Late,” I had my reason. 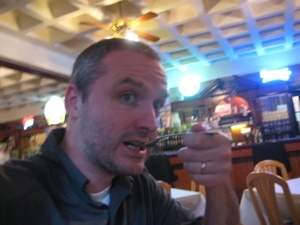 And I also had a lunchdate – none other than Jordan from Hartford.com. First, some notes from this exellent article by Tom Condon about the unique building. “A food writer once described Hartford’s Polish National Home as “built to withstand the onslaught of Russian tanks.” Given Poland’s history, perhaps this was at the back of the architect’s mind. If you’re only passingly familiar with the building on Charter Oak Avenue, your first question may be: “Why doesn’t it face the street?” The answer is simple: It did. When the club was built, there was a street facing the front door, Governors Street. The city removed it in the late 1960s to build a housing project. The story isn’t the street, it’s the hall. This remarkable edifice was built by a neighborhood of first-generation Polish factory workers. 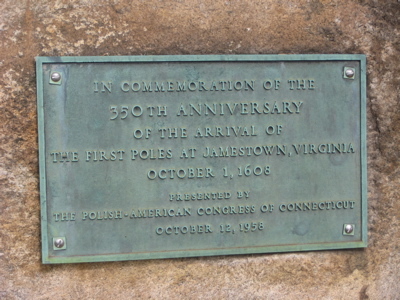 Poles started coming to Hartford in the 1870s, refugees from yet another heroic and failed insurrection. They worked in the factories south of downtown; Colt, Capewell, Allen and others. By the 1920s, there were 3,000 Poles living in the neighborhood, of an estimated 7,000 in the city, said Polish home historian Andrew Bogacki. They’d outgrown their small meeting hall. 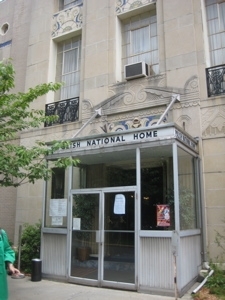 Many ethnic groups, including other groups of Poles, built modest clubhouses in cities across the country. Even Bogacki isn’t quite sure why the community decided on something this grand. “Maybe it was our all-or-nothing mentality,” he said. Grand was the plan. 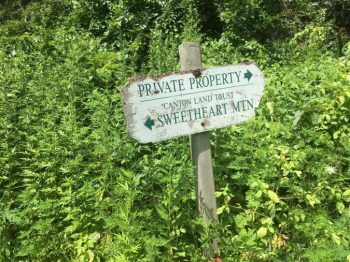 Community leaders sold shares and broke ground on Oct. 8, 1929, just days before the stock market crash that ushered in the Great Depression. 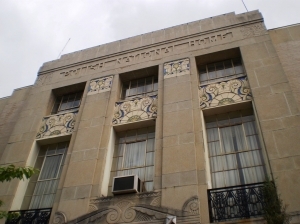 Nevertheless, the building opened a year later, Oct. 12, 1930. It was immediately acclaimed as the finest Polish center in the country. Thanks, Tom. Good stuff. And yes, the New Britain (aka “New Britski”) Polish community is huge. I had a wonderfully fun, weird and at times scary day immersed in it which you can read about here. One last thing about the building before we (finally) go inside: It survived the massive flood of 1936 when four feet of water engulfed the building. There is a teeny tiny little marker on the side of the building commemorating this event, which Jordan and I sought out here. All this backstory has made me hungry. Let’s go inside and eat up some Polish food already. As with all ethnic and social clubs, they have members. Some admit visitors with members, some are more liberal with their policy. It appeared to me that the PNH allows anyone in to eat in the dining room. We signed the visitor’s log and took a seat. I knew what I’d be ordering – the Polish plate – so I barely looked at the menu. 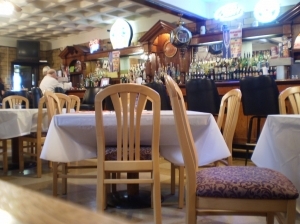 “The mother of them (Polish eateries around Connecticut) is the Polish National Home in Hartford, a massive concrete edifice that looks less like a restaurant than like one of the secret societies around Yale in New Haven. 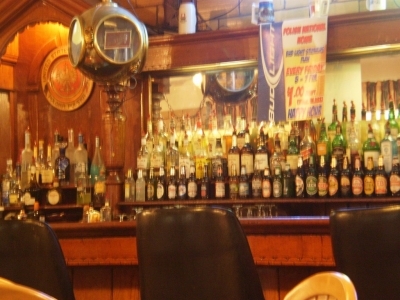 It is a tavern, a restaurant, a clubhouse, and a place to go dancing on a weekend night. Its menu is a Polish primer of utmost excellence. It goes on a little longer, but you get the point. Delicious. As most of you know, I’m not really a meat-eater but have put aside my ethical aversion to the meat industries for this eating section. When Hoang prods me about what I miss most about cow and pig I always say “the smoked meats.” This kielbasa was almost good enough for me to renounce my renouncement of meat. The potato pancakes were phenomenal – crisp on the outside, smooth and creamy on the inside. And the pierogies? Forget about it. Better than your Polish grandmother makes, trust me. 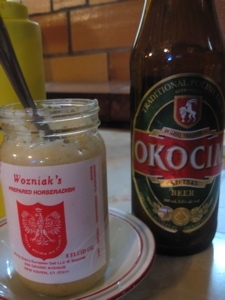 As a bonus, the PNH offers a hot horseradish and hot mustard to accompany your dishes. Two condiments I can never get enough of. Oh yeah, I got some applesauce with my meal as well. I may have saved the best part of eating at the PNH for last: It’s ridiculously cheap. Dirt cheap. Can you read the price of the Bud Light Draft at Happy Hour? One Dollar. Not zÅ‚oty, but dollar. Here’s the New York Times review – much better than mine. Not Hartford’s Wurst Kept Secret? I grew up in this place in the 70’s…my mom, dad and I were there every Sunday for lunch! I need to come back “HOME”! My daughter looked high and low for a wedding hall and loved this the best. The ballroom is beautiful. Hmmm.. went there and wasn’t very impressed. 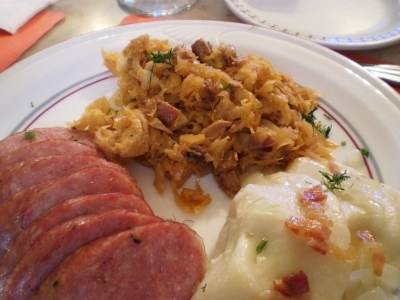 I am Polish and learned to cook from the European part of the family so I may be a bit jaded. There is better Polish food in New Britain. ill keep it short ..
the food was always great , but now its even better , the chefs are tweaking things in a good way , the bacon shavings ….. ! thin crispy fries , teh gravy ,,, the horse radish …..the bigos …..
i no longer have a grandma , or a mom in law , so that great home cooking is a memory , unless you come here . Here its just like grandma used to make … maybe even better , a real hearty plate of food on a blustery day , with some friends , in a booth , with giant polish beers – is what its all about . Even the salad , no greens [ formerly known as compost ] in a tangle . nope … romaine , all the best parts , cut up small so you dont have to do all that sawing .. I don’t think I will hear from you, but I am hoping that I will. My name is Victoria Johanne (Wlochowski) Cocco. My grandparents Anna Wlochowska and Stanley Wlochowski were among the original founders of the PNH. My uncle Richard Itczak, owner of Wandy’s Pies used to bake rye bread for the home. Last note of interest; to this day I make placki (potato pancakes) in my grandmother’s cast iron pan (has to be at least 80 years) and I make galombki and pierogies.